The weather outside is a cool 70° in Atlanta! Does this mean fall is on its way? I sure do hope so! I’m ready for cooler temperatures, sweaters and fall’s latest trend: Color Blocking! 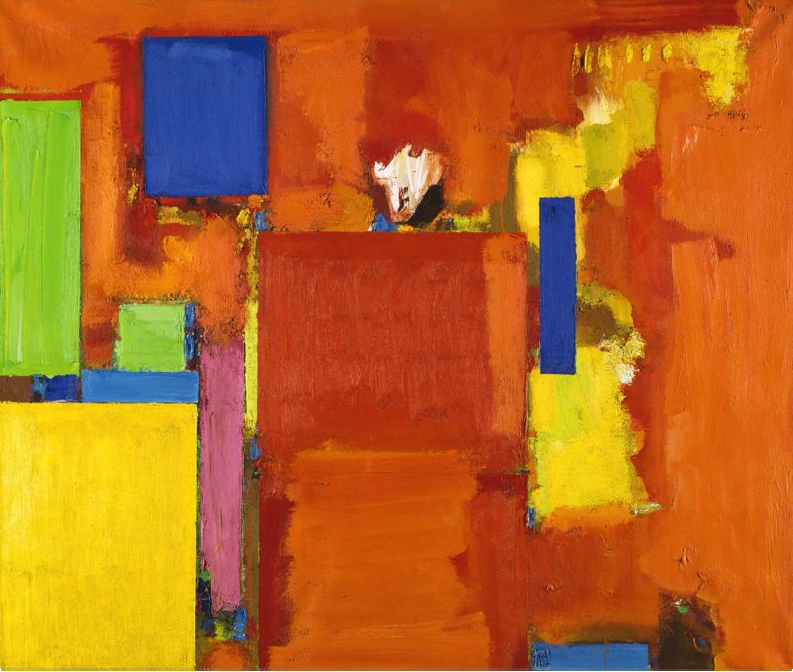 As someone with two art degrees, I remember learning about color block painting as a movement in the mid 20th century. One painting that particularly stands out to in my mind is Hans Hoffman’s The Golden Wall. Interesting as art but as fashion trend? A few concerns: How it will affect those of us who are standing on the shorter end of the spectrum. I’m 4’11” so I’m afraid that wearing large blocks of color aren’t going to be right proportionally. Next concern: Is this trend indeed a trend, and will it be gone the moment I hand over my cash to the salesgirl? Are these pieces worth spending the money on? Where is Stacey London when you need her? I have made a few studious attempts to try and educate myself on these concerns. I am not one to be too fashion forward, but I guess better late than never! Wearing color blocking does not necessarily have to mean, large stripes of color. You can choose large areas of solid colors to create the color block look. For example, you can wear a neutral pair of pants and add a bright hot pink tank underneath a bold orange sweater, or something to that effect. And for those like me, who are afraid of looking too crazy, when you often only wear neutrals, start with neutral colors closest to your face and get a little bolder with your color choices as you move down. Isn’t that cool? A little fashion trend 101 for ya! I’ve put together a few items that may be purchase worthy and still fit the trend. Not sure if I will actually go through with it or not. But if I do, I plan on shopping on the low end, just in case the ship sails away quickly. And do not worry, you’ll be the first to hear if I submit! Ah Weddings! They are a ton of fun if you are not the bride. No just kidding. I enjoyed almost every minute of planning my December 2010 wedding. The weather was perfectly chilly, blue skies and just magical when we said I Do in the beautiful French Quarter! But I digress. This week I’m going to an out of town wedding in Washington DC and weddings are the perfect opportunity to play dress up. I don’t have too many dress wearing opportunities but I love to buy them! One of my favorite places to buy affordable dresses is Modcloth. They are hit or miss and I probably return 25% of what I buy from them. Modcloth has tons of designers on consignment, so sizes vary and I have fit issues from time to time. But when they fit, they are excellent and I usually can find super cute well made dresses for around $50. I thought I’d share with you my weekend wedding fashion. All things I’ve worn before and love. I really wish I were wearing a fascinator like the Brits, but I’ll settle for this cute hat just in case we are outdoors.